Regular contributor Jim Tether has sent in these two photographs of the British School which he attended in the late 1940's/early 1950's. 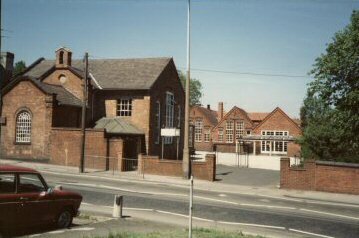 When Jim attended this school , the Infants Headmistress was Mrs Simpson and Misses Hobley and Hunt, Mrs/Miss Adams and Mrs Watkins were amongst the infant teachers. The Junior School Head Mistress was Mrs Dowd and the other teachers were Messrs Oakley, Gotel and Wilson. School helpers were Mrs Butler and Mrs Probert. The British School owed its origin to Caleb Bloomer who in 1867 built the Islington Ragged School in Stourbridge Road. He lived at Beulah Lodge . He passed away while on a trip to the Holy Land in 1872 and the school was bought by the Primitive Methodists. 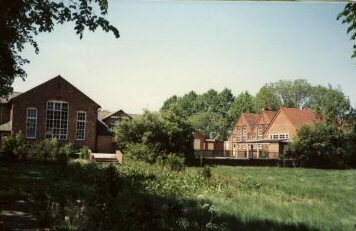 A day school, called the British School, attached to the Congregational Church in the Great Cornbow was outgrowing its accommodation so in 1878 it merged with the Ragged School in Stourbridge Road . The combined school being named the British School. The name of the school was subsequently changed to Hawne County Primary School and it kept that name until it closed in the 1980's. I have very little information about this school so if anyone has any more photos or information please send it to me for inclusion on this page. I went to this school from 1942 to 1949.The Junior School headmistress was a Mrs Williams, who died in 1949. There was a playing field at the rear of the School with air raid shelters in which we used to play. I remember well Miss Hobley who took us for the 1st year. She used to heat my legs up on a regular basis and Mrs Wilson who liked to prod you with her finger. It was a wonderful place to become primarily educated. I have just come across the British School page by Jim Tether in "Halesowen Roots". As you may know the excellent "Halesowen Through Time" books by David Eades contain a few pictures of pupils at this school in the 1950s. I attended that school from 1950 to 1956. In 1950 its official name was "Stourbridge Road Junior School" and this was changed to "Hawne County Primary School" sometime during my period at the school. I must have had a pretty sheltered life pre school as in my early years at the school I struggled to understand the strong Black Country accents of my fellow pupils. Neither of my parents had a Black Country accent; my mother came from Birmingham and my father (a schoolteacher at Rowley Regis Grammar School) moved around England (Dorset, Derbyshire and Devon) as my grandfather was a congregational church minister who was moved to a different church every 5-10 years or so. In those days young children walked to school on their own and I walked about half a mile along the Stourbridge Road from number 300 (at the summit of Witley Hill). I remember my mother took me on my first day, but after a few weeks (learning the route?) I was left to find my own way. People were friendly and often stopped to speak to us. I remember also having difficulty understanding those friendly strangers. There were also not so friendly strangers who saw their role as helping to discipline youngsters growing up and would not be slow to quite severely admonish any behaviour which they deemed naughty. And, to tell the truth we often (but by no means always) deserved these verbal reprimands. Often I was asked what school I attended. I always replied "Stourbridge Road Junior School". The Black Country speakers never seemed to understand this and sometimes another bystander would say something like "you mayne the British skowl". I never heard the school referred to as the "British School" by any of the teachers, or indeed any of the pupils. Until I saw this page, I never even knew that at one time the official name was indeed "British School". I thought that this name was just some sort of weird local diallect usage. The Infant School headmistress in 1950 was Mrs (or Miss) Simpson. I was taught by Mrs (Miss) Britton (or Britain) and Mrs (or Miss) Hunt. My first day was 5 September 1950. All three of these ladies were wonderful. I was in the Junior School for 4 years, but only had two teachers as the teachers of my first two years were both promoted to higher classes. The gem of a teacher was Mr George Berry. Under Mr Berry the school obtained a record number of 11 plus passes in 1956. Well over 20 in his class of about 30 as I remember. I understand that Mr Berry, was still alive in his 80s, about 12 years ago and living retired in Hertfordshire where he was a headmaster somewhere. Mr Berry was a Lancastrian who supported Preston North End. Nearly all the boys supported Wolves or Albion (but rarely got further than cheering for Halesowen Town at The Grove on Saturdays). In 1954 Preston played Albion in the Cup Final. The only person that I know who attended was Mr Berry who got his ticket by queueing up at the Hawthorns when they went on sale. He was obviously able to stand amongst the Albion fans without anybody threatening to "smash his face in". I was a Wolves fan, but as Wolves won the League that year we did not really mind Albion winning the cup. My other teacher was Miss Parkes until she married one Saturday morning at Halesowen Parish Church and became Mrs Shepherd. Mrs Dowd was the headmistress. She was quite a formidable person, not one who tried to endear herself to the pupils. I remember also some other teachers were Mr Higgins (very tall) and Mr Wilson. And another Infant school teacher was Miss (Mrs) Williams. I can't remember any of the teachers owning cars. Mr Berry used to cycle to school and Mrs Dowd used to wait at the stop outside the school with at least one other teacher for the 205 (?) bus which used to go to Quinton and Blackheath. My fellow 11 plus class pupils are all pictured with Mr Berry in one of the David Eades books. A "famous" past pupil is Glen Kirton, former top administrator of the FA and Tournament Director of Euro96. He was a couple of years behind me. I always feel that my roots are Halesowen although born in Birmingham; we moved to Halesowen when I was around 2 years old, so my earliest recollections of growing up are from Halesowen. I still remember how upset I was when my parents bought a bigger house in Kingswinford and we moved in 1957! I was just in correspondence with some people who were doing research into the Kirton family of Cradley and the British School / Stourbridge Road Junior was mentioned, which prompted me to look up when it changed from one name to the other. I found your excellent page and read Brian Lauckner’s post with interest, not to mention some embarrassment at being described as a famous former pupil! I started at the infants in 1952 (Miss Adams – she also taught my mother, who is 86 and going strong in Halesowen still) and remember well the terrifying Mrs Dowd. My Nan Brown used to come and get me at the end of each school day with a football and had serious trouble getting me away from the kick-about on the Rec. Mr Higgins was everybody’s favourite and I have a picture of him somewhere at my Mom’s with the football team. I was a rubbish overweight right back while Stuart Rudge and David Macklin were the stars. The picture of the school brought back many memories, most of them happy ones! Glen has spent his working life in sports administration, sports marketing and event management. At the Football Association, he acted at various times as Competition Manager, Press Officer, Commercial Director, TV negotiator, England Team administrator and finally as Tournament Director of Euro 96. He is now Chief Operating Officer at Rushmans , a consultancy and international event management company engaged in all aspects of major sport and political events worldwide.